Welcome to March! I’ve got another incredible soup recipe coming in HOT for your kitchen. Here in Chicago I’ve learned to expect winter to last through April, which is why I load up on nourishing, soul soothing soups all season long. Let’s get into this bowl of love I took the global flavors from my absolute fav curry recipe, combined them with the heart and soul of my best ever chicken soup, and this baby was quite literally born. 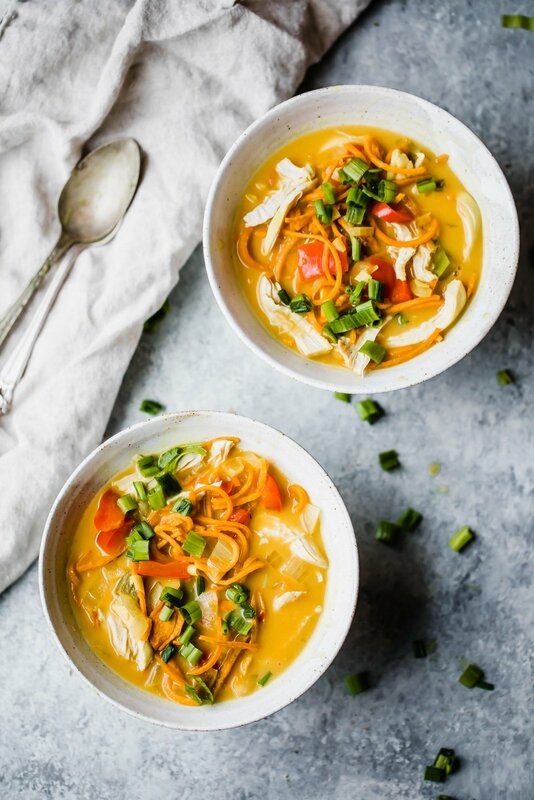 Oh and because who doesn’t love noodles, say hello to sweet potato noodle soup. The last time I made something spiralized with sweet potatoes, you guys fell in love, so say hello to my latest and greatest sweet potato noodle recipe. I’ve said it once and I’ll say it again: this AIN’T no Campbell’s. It’s elevated, creamy, flavorful and everything you’ve ever wanted in a healthy paleo/whole 30 friendly soup. Personally I follow neither of those diets, but providing options for you is what I do best. 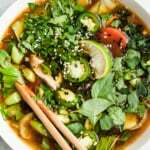 Most of all, I love how nourishing this soup is and the wholesome ingredients involved: healthy fats, complex carbs, lean protein. 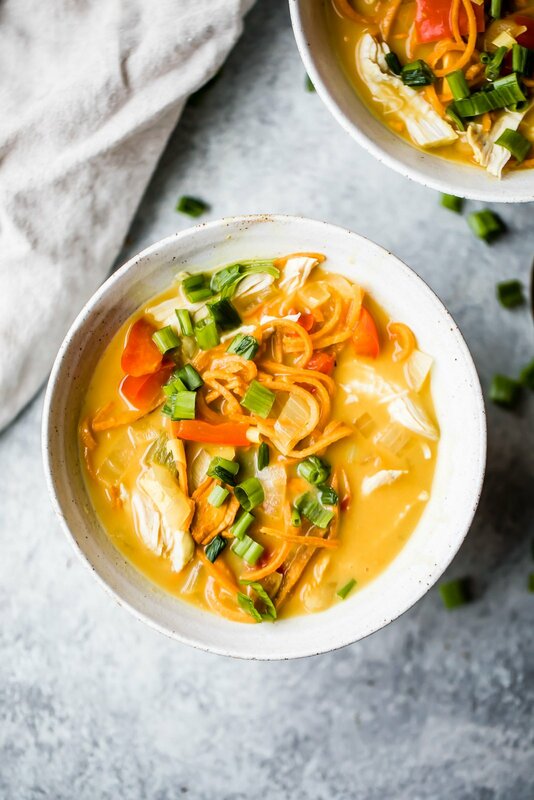 SO MEET YOUR NEW BFF: COCONUT CHICKEN SWEET POTATO NOODLE SOUP! Garlic and ginger: these anti-inflammatory powerhouses are a must for me, especially during cold & flu season. 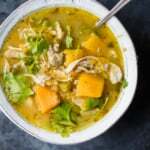 The fresh ginger is also great for digestion so you can bet this soup feels as good as it tastes. Coconut milk: besides the delicious flavors and healthy fats coconut milk adds to this recipe, it also packs a anti-bacterial and anti-viral punch. Basically it’ll make you feel like the superhero you are. Lemongrass: I’m. Obsessed. With. Lemongrass. Seriously I use my lemongrass-scented essential oils in my diffuser while cooking up cozy dishes with a fresh stalk. 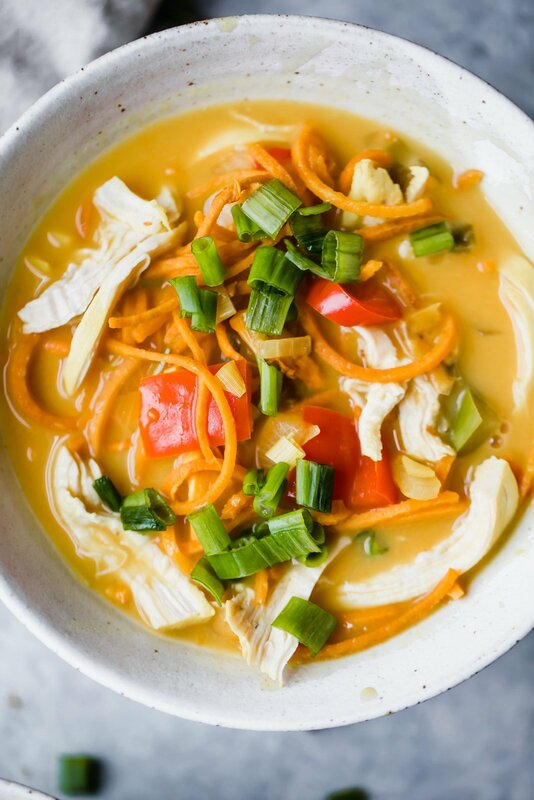 Besides adding an incredible aroma and flavor to this recipe, lemongrass is immunity-boosting and great for digestion. Now how do I plant this on my porch?? SOMEONE TELL ME. 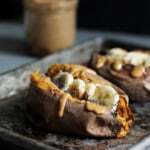 Sweet potato: these babies pack plenty of vitamin A & C, and a great source of fiber to keep you feeling full and satisfied. Plus the sweet potato noodles soak up all of the delicious flavors in the soup without getting too soft. Best noodles ever! Cheers to March and cheers to sharing a warm bowl with someone you love! Feel free to lady-and-the-tramp those sweet potato noodles… I won’t judge. xo! Add in coconut milk, chicken broth, chicken thighs, and nut butter (if you'd like). Stir well to combine. Bring soup to a boil. You’ll want the chicken to be covered by the broth so make sure you stir them down to the bottom. Reduce heat to medium low and simmer uncovered for 20 minutes or until chicken is fully cooked. 2-Ingredient Paleo Chocolate Frosting (plus TWO other ways to use it!) Ambitious Wedding Part 3: The Reception, Food & an Epic Donut Wall! 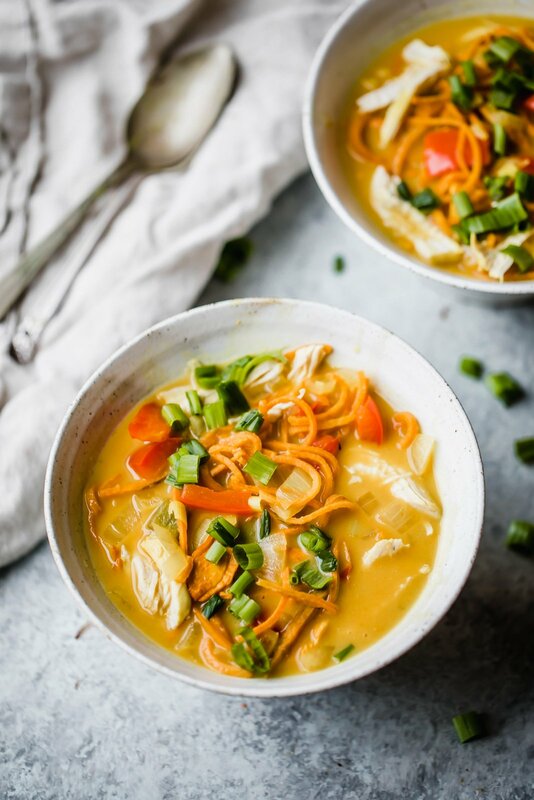 46 Responses to "Paleo Coconut Chicken Sweet Potato Noodle Soup"
I second that question! Those “noodles” look perfect! Which spiralizer did you use? Thanks for this recipe! Sounds delish! Question- if you don’t have a “spiralizer” any suggestions on a second option how to prepare the sweet potatoes? You could try thinly slicing them, or even small chunks of sweet potato would be delicious in here! I really like the added coconut milk!! Spiralized sweet potatoes is SUCH an amazing idea. YUM! When do you add the lemongrass? It’s not in the instructions, and I’ve never used it before! Hi! When do you add in the basil? I would think maybe as a garnish, but I didn’t see it mentioned in the instructions? Hi Lindsey! Add it in with your garlic, green onion, etc. Thanks for the catch – I’ve updated the recipe! Finally got to looking at this! YUM, I can’t wait to make it! Next week I’ll hit the Asian supermarket for the lemongrass, turmeric and basil, have everything else yaye! It is gonna be so good, I already know! Hope you love this one Denise!! This looks delicious! 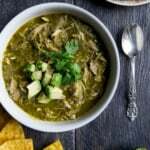 Can you make this in the slow cooker? Can’t wait to try it! Making this soon! We have tons of tumeric, a spiralizer, and an Asian market down the street for lemongrass! 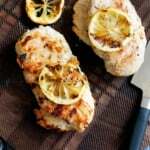 Thank you for such great Paleo recipes! Just made this and it’s one of the best curries I’ve ever had! I couldn’t be bothered spiralising, so I just cut up the sweet potatoes and added them with the chicken. Awesome dish! Aren’t the flavors amazing? Cut up sweet potatoes sound perfect in here too! Hi, this is delicious but I’m confused about cooking the green onions until they’re “translucent and slightly golden” makes me think I should be using regular onions? Hi! could you substitute carrot noodles? Made this tonight for dinner and it was AMAZING! Added jalapeño and a little lime! Could I use the extra meat from my rotisserie chicken? Made this with leftover thanksgiving turkey and it was delish!! Didn’t have lemongrass but was still super flavorful. What a great way to use leftovers….thank you!! Perfect! Such a great way to use leftovers. When do you add the nut butter? Just made this yummy soup and it is ah-mazing! Thank you! I know I’ve already commented on this recipe but I just want to say I’ve made this soup several times since Thanksgiving, changing it up a bit each time, and it is soooo yum! I’ve used tofu instead of chicken or just thrown in some other veggies, the spiralized sweet potatoes are great but when I’m in a rush I just chop them instead…doesn’t matter it’s always delicious! 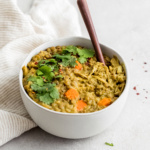 This has already become a staple soup for the winter months…and easy and quick enough to throw together after a busy work day. Thank you!!!! I made this for dinner tonight, it was the best soup I have ever had. I added: cauliflower, mushrooms, green beans, peanut butter, a splash of soy sauce and a splash of fish sauce for some more layers of flavour. This will be my go-to recipe!! On another note, how do you store your lemongrass? Haha I’m so glad you found it! Love your additions here. And I store it tightly wrapped in the fridge! I made this over the weekend as it popped up in my Pinterest and OMG, so yummy. I struggled a bit with the sweet potatoes as my little Veggeti couldn’t quite get the job done. Also had never used lemongrass before and it turns out after reading the label on it, most of it doesn’t get used. Will probably leave that out next time because it was pretty pricey for two sprigs. I was going to ask what type of spiralizer you used to get your’s so perfect, but you’ve already provided that information! I added the peanut butter to mine and also a bit of curry powder and this is really yummy! Thanks for another great recipe, Monique!